Name badges are the perfect way to say, "Hello!" As the creator of the "Hello, my name is" badge, and a market leader in name badge holders, we're ready to meet your every need with clip, colored stripe, clip/pin combo, pin, magnetic, hanging, security and pressure sensitive name badges and holders. This fabulous self-expiring badge is the perfect product for visitor control. Once it's expired, the badges reavel a highly visible color indicator. With the capability to identify any trespassers up to 50 ft. away, it is creating a safer and more secured environment. Welcome to MyBinding video. 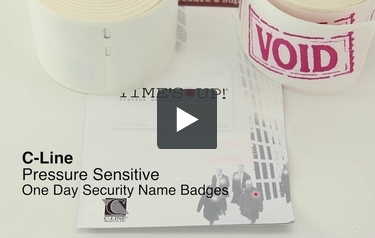 Now here's a cool idea: Pressure Sensitive One Day Security Name Badges by C-Line. This package contains two rolls, a blank roll for the nametag and a void sticker roll. The blank sticker goes over the void sticker. And once you've printed your name, either by hand or by machine, the nametag then starts a clock, and 24 hours later, it will be expired. It's simple as this. You've got your name on the front, you place it on the person. 24 hours later, bam! The word void magically appears from behind; helpful and cool. For more demos, reviews, and how-to's, check out MyBinding.com.